OPINION | Could Vision 2030 Reforms Destabilize Saudi Arabia? Home / Government / Opinion / Saudi Arabia / The Middle East / OPINION | Could Vision 2030 Reforms Destabilize Saudi Arabia? Last month Saudi Arabia’s 31-year-old deputy Crown Prince Mohammad bin Salman (MBS) proposed a bold economic plan to end the kingdom’s “addiction” to oil by 2030. MBS’ “Vision 2030” would transform the Saudi economy by reforming the bureaucracy, bolstering the private sector, and building the world’s largest public investment fund. Vision 2030 is also a promise to the kingdom’s youth for greater opportunity and a more efficient and transparent government. With plunging oil prices and a budget deficit expected to reach 13.5 percent of GDP, Saudi Arabia clearly needs bold reforms. 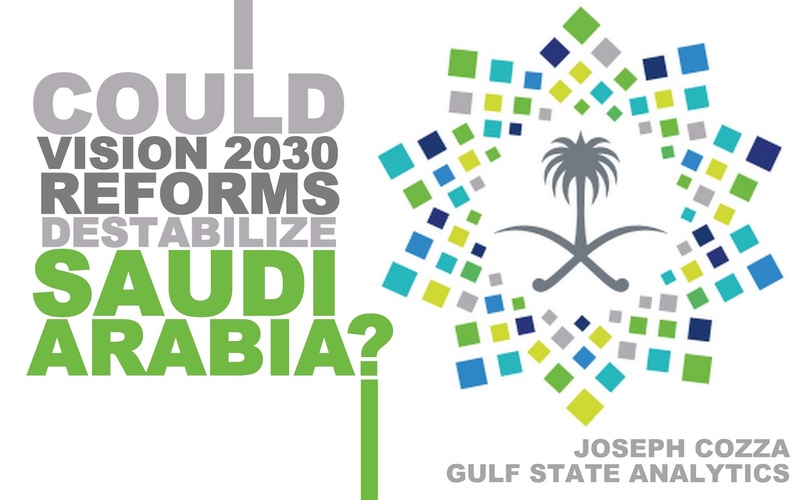 Although the international press has focused heavily on the economic aspects of Vision 2030, it is important to analyze potential repercussions for Saudi Arabia’s social and political systems. Throughout the last century, oil and Wahhabism largely shaped the kingdom’s socio-political landscape. Breaking from the nation’s oil dependence, however, may generate political and social instability by altering the relationship between the state, traditional elites, and Saudi citizens, especially if the transition is not as smooth as planned. Rentier states derive a significant percentage of their revenue from the rent of natural resources to external clients. These states take a dominant role in the economy by distributing resources to the population in the form of public services, subsidies, and employment in bloated state bureaucracies. Political scientists have argued that the population’s reliance on the redistribution of these rents is connected to the perpetuation of authoritarianism. This rentier model shaped the economic, political, and social development of modern Saudi Arabia. The massive profits derived from oil rents allowed the monarchy to consolidate its rule and dominate the expanding, centralized bureaucratic state by co-opting traditional tribal and business elites and rival family members through patronage, government contracts, prominent bureaucrat posts, and public service projects. This bloated bureaucratic structures lacks transparency and is often extremely inefficient and rife with corruption. Though tribal identity, structure, and loyalty remain salient, the consolidation of the major tribes behind the monarchy by giving their leaders prominent posts and influence has helped ensure the monarchy’s stability and has eased regional tensions. These leaders serve as mediators between the state and members of their tribes, ensuring an institutional resolution to tribal disputes. The state has also developed close ties with the Bedouin through the Saudi Arabian National Guard. The ultra-conservative Wahhabi religious establishment has also been coopted through the use of oil rents. In return, the clerics provide legitimacy to the Al Saud rulers. The alliance between the religious elite and the state has given traditionalism and religion dominant roles in society. Thus, rentierism has preserved traditional identities and elites while making them dependent on the state. This dependency extends beyond the Saudi elite. Oil wealth allows the state to earn revenue without taxing its citizens, and authorities distribute rents to Saudi subjects in the form of significant subsidies on housing, fuel, water, and electricity. The state is also the country’s primary employer, creating a large state-dependent middle class. In order to afford these subsidies and salaries, the state significantly restricts citizenship, with many foreign nationals dominating working class jobs. These foreign nationals remain in the Kingdom for only a few years, are closely monitored, and do not have a path to citizenship, keeping them politically disenfranchised. Although Vision 2030 is a bold and popular plan to end Saudi Arabia’s dependence on oil and spur economic revitalization and a more efficient government, it could jeopardize decades of relative political stability and upend the social order by fracturing the relationships forged by decades of rent distribution. The reforms aim to enhance the private sector in Saudi Arabia through investment in non-oil industries, locally-sourced military procurements, and the privatization of government-owned industries. The goal is to develop a thriving private sector that can provide sources of non-oil exports, generate economic growth, and employ young Saudi nationals. Though there is no plan to levy income taxes, Vision 2030 calls for a phased reduction of subsidies for fuel, water, and electricity. It also proposes the issuance of new green cards to foreign nationals employed in Saudi Arabia, potentially altering the political disenfranchisement of the kingdom’s sizable working class. These reforms, if successful, will create a new capital class that would be less dependent on the state. Yet this newfound independence could amplify demands for political reforms, especially if the economic transition is rockier than expected and not enough private sector jobs are created to replace diminished bureaucratic positions. These demands could spark a wave of contentious demonstrations similar to 2011’s Arab Spring, challenging and destabilizing the monarchy. Efforts to streamline and privatize the bureaucracy to grow the private sector, eliminate corruption, and create greater efficiency also threaten the kingdom’s greatest source of elite co-optation, bureaucratic appointments. Not only could streamlining the bureaucracy cost Saudi subjects their employment in the state apparatus, reshuffling cabinet positions and high posts to include more technocrats can create resentment within the elite class and royal family, who fear a loss of influence and prestige, and a challenge to their lavish lifestyle. There have also been discussions of changing the line of succession to promote MBS over Crown Prince Mohammad bin Nayef, which could further inflame tensions within the Al Saud family. Resentful elites and royal family members could undermine reforms, challenge the line of succession, and destabilize the system in an attempt to regain lost influence. Regional tensions and tribal conflict could also flair if tribal leaders no longer have an incentive to support the ruling family. The reforms also have major implications for Saudi society, presenting an opportunity for a greater opening while risking a conservative backlash. The plan calls for an increase in women’s labor force participation, investment in tourism that promotes pre-Islamic history, and market-oriented reforms to an education system controlled by religious elites. These reforms may face opposition from Wahhabi clerics who believe that increased private sector employment, secular education, and a larger role for women in society could spark demands for greater social reform. These demands would challenge the traditionalism promoted by the state and religious establishment and could limit the cleric’s power and influence over Saudi society. If officials in Riyadh support greater social openings, tensions between the state and the religious elite could grow, fracturing the critical alliance that has helped ensure regime durability. If the clerics perceive challenges to their power and influence, there are risks of further instability at a time when a host of other issues, ranging from Saudi Arabia’s geo-sectarian cold war with Iran and growing crisis of Sunni fundamentalist terrorism, present their own threats to long-term stability in the kingdom. To properly manage these reforms and prevent destabilization, Saudi Arabia must proceed with caution, ensuring the cooperation of potentially destabilizing actors while carefully easing the distribution of rents. As Saudi Arabia grapples with low oil prices, a ballooning deficit, and a crisis of youth unemployment, the revolutionary reforms in Vision 2030 offer hope of a more secure future. Diversifying Saudi Arabia’s economy, ending its dependence on oil, promoting greater employment opportunities, and streamlining the state bureaucracy would help spark needed economic development and would make the Saudi economy more dynamic, promoting greater growth and prosperity. However, the reforms needed to accomplish this goal, while popular, could ultimately destabilize the monarchy by challenging established relationships between the state, traditional elites, and the subjects if not properly managed. Joseph Cozza is a contributor to Gulf State Analytics (@GulfStateAnalyt), a Washington, DC-based geopolitical risk consultancy.